Set like a getaway resort, Sunhaven is a new development designed to wow the lifestyle-people with its array of facilities and modern architecture. It is at the Changi vicinity, which is close by to the Singapore Expo, Changi Business Park, Singapore Changi airport; East Coast beach and East Point Shopping mall, The nearest MRT would be the Simei MRT station. Sunhaven is also well served by expressways including the Pan Island expressway (PIE), East Coast Parkway (ECP) and the Tampines Expressway (TPE). Kids and adults can enjoy swimming in the free-form swimming pool that boosts a fantasy beach, which resembles that of a real beach. The pool in Sunhaven is designed for the leisure and serious swimmers. There is so much things to do, you may not be able to complete all in a day. Children can have fun at the adventure playground which helps tailor to the kids’ imagination and energy. There is a “Pirate Ship” in the waters which kids can explore. There is also a “Flying Fox” slide for the playful children. For the recreational skaters, there is a skating ring with ramps which you can test your skills or just grind your skills on the ramps. Each unit in Sunhaven is meticulously designed with the category-5 cables and LAN (local area network) access throughout the unit, allowing computers within the home to be networked for convenience. Also equipped with CCTV points in the home and the estate, residents can find out the latest news and happenings at Sun Haven! All units in Sunhaven is also equipped with an alarm / motion detector system which is designed to alert messages to assigned pagers or mobile phone numbers. Peaceful living area surrounded with lushy greenery. Fantastic facilities, the swimming pool is designed to mimicked a beach with palm trees, among others there are tennis courts, gym, playground and even a basketball court. Truly a place to be for the active, fun and yet loving the peacefulness. Like a resort, it has a modern architecture. It is at the Changi vicinity, which is close by to the Singapore Expo, Changi Business Park, Singapore Changi airport; East Coast beach and East Point Shopping mall, The nearest MRT would be the Simei MRT station. 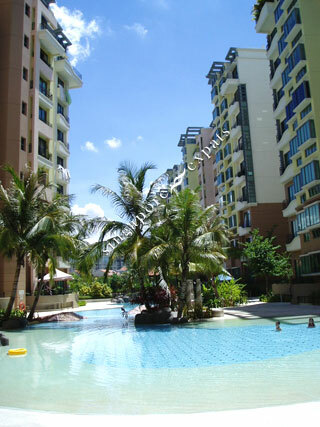 A wonderful low rise condo with great facilities. Beautiful surroundings with the giant pool as a great focus point!